Baby Bear Sees Blue | What is ML Reading? She said, “I need books on pumpkins, leaves and apples.” I explained specific books on those themes were checked out, but I could add her to the request list. I offered Baby Bear Counts One while she waited for the other books to arrive. I opened the book showing the title page illustration with the oak tree, falling leaves, squirrel and acorns. The illustrations are created by printing linoleum blocks in black ink on paper. Next, they are hand colored with a fall watercolor palette. The power of the ink block prints and the warmth of the watercolors bring Baby Bear Counts One to life. Preschool teaching themes are simple. Seasons, colors, number, etc. I’ve been a preschool teacher. I know how monotonous books on specific themes can be. 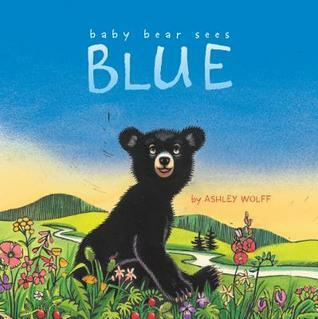 So I introduced the teacher to another Ashley Wolff book, Baby Bear Sees Blue. The teacher checked out both Baby Bear books. I told her I am at the library every Wednesday night. She’s been back; eager to find new books for those important preschool themes she’s taught for over 20 years. I just heard some geese flying overhead while writing this piece. I laughed. It’s a scene straight from the book. “Mama looks to the sky. Honk! Honk! Honk! “Who is calling to us Mama?” asks Baby Bear. “Those are the geese,” says Mama, “flying south before winter comes.” There’s a group of Canadian Geese who winter at ML’s Papa’s pond. Who knows? Maybe they’re in flight to Georgia. DISCLOSURE: I follow Ashley Wolff’s blog and she follows mine. She provided helpful advice on how to tame my daughter’s curly hair. There haven’t been any tears since she told me to drop the shampoo and just condition ML’s hair. 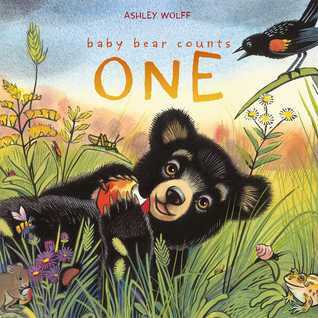 This in no way influenced my opinions about Baby Bear Counts One. If anything, I didn’t gloat as much as I should have about this book.